IN Round 16 of the WAFL Colts competition, East Fremantle defeated Perth by 12 points at Lathlain Park and Lenny Fogliani was there to capture the action. The AFL Academy member produced a performance that would have enhanced his draft stocks. The young cousin of Fremantle pair Brad and Stephen, Hill was electrifying against the Sharks with 25 possessions, six marks, six inside 50s and three goals. His speed, class, vision and decision-making were all on display. In only his third game for the Demons, Hodder was dazzling in the forward half. He collected 14 possessions, recorded five inside 50s, laid three tackles, took two marks and booted a goal. His desire to take the opposition on was superb for such a young player. The All-Australian representative continued his fine season with yet another polished display. He gathered a game-high 26 possessions, laid a game-high 12 tackles, recorded a game-high seven inside 50s and took three marks in a sensational performance. His draft stocks continue to soar weekly. The Queens Park junior was sublime on the half-back line for the Demons with 17 possessions, five marks, three inside 50sand two marks. His reading of the play, and skills were critical in keeping the Demons within the contest. The 17-year-old produced his best game for the Demons against East Fremantle in just his eighth game of WAFL Colts. He finished with 15 possessions, six tackles, three inside 50s and two goals in a sublime performance. Before he injured his knee in the second quarter, Hansen showed why he is such a highly rated prospect from WA this year. He had 10 possessions midway through the second quarter, and his pace, aggression, skill and reading of the play were all on display. The Thornlie junior enhanced his prospects for the AFL Draft next year with another superb display. He finished with 15 possessions, four inside 50s and a goal in a lively performance. His damaging disposal makes him a weapon in the forward half for the Demons. The Mullewa product is a human highlight reel and it was not hard to see why against Perth. In the opening 40 seconds of the game, he took a spectacular mark similar to that of Ashley Sampi’s 2004 Mark of the Year. His ability to weave his way through traffic is simply sublime and more often than not he had the Perth defenders nervous. He finished with nine possessions, eight hit-outs, five marks, three tackles and three goals. The Aquinas student was easily East Fremantle’s best midfielder with 24 possessions, five inside 50s, four marks and four tackles in a powerful display. His willingness to burrow himself at the bottom of packs, rip the ball out of congestion and then find a target is first class. Stationed on the half-back line, Diggle was instrumental for the Sharks repelling the Demons’ attacking forays. He also provided superb rebound for the Sharks and was often a catalyst for them going forward. He gathered 15 possessions, laid two tackles and took two marks. The 2016 WA State U16s Academy representative was arguably the Sharks most valuable player against the Demons. Playing in defence, he accumulated 20 possessions, took six marks, recorded four inside 50s, laid two tackles and kicked a superb goal from the boundary about 45 metres out. The reigning WAFL Colts Leading Goalkicker was switched into defence for the Sharks and he handled the move with aplomb. His reading of the play, skills and leadership were all crucial for the victory. He finished with 20 possessions, four marks, and two tackles in a solid outing. In only his third game of WAFL Colts, Jackson demonstrated that he belongs in the professional environment. He threw himself into every contest, kamikaze style, and would often rip the ball out to his runners. He finished with 19 possessions, 11 tackles, four inside 50s, three marks and a goal in a dazzling display. The East Fremantle captain was without doubt the most imposing ruckman on the ground. He finished with 32 hit-outs (Perth in total had 17), 11 possessions, five tackles, three marks and three inside 50s in a true captain’s performance. His ability to give first use to his midfielders was first-class and his desperation to cover the ground was phenomenal. 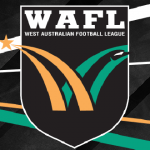 THIS weekend produced the most exciting round of West Australian Football League (WAFL) Colts football so far, with every game decided by two goals or less, including three games by a combined nine points. 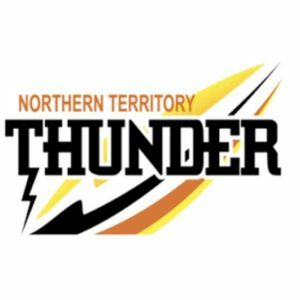 Peel Thunder has upset Subiaco to hand the Lions their second consecutive loss with a narrow four-point win at home. Subiaco looked on top early, booting eight goals to four in the first half, but could only manage one after the main break as the home team piled on seven, to run away with the contest and claim a vital four points and move back into the top five. Peel’s Lachlan Riley had 23 disposals, seven marks, five inside 50s and three tackles, while Andrew Butler also managed 23 disposals, three marks, four inside 50s and five tackles. Lachlan Cullen played an important role down forward, booting 3.3 from eight disposals, while Jaxon Egan finished with two majors. Jake Howes was the other player over 20 disposals, with 21 touches, three inside 50s and seven tackles. For the losers, Tristan Hobley topped the disposal count with 26 touches, nine marks, three inside 50s and three tackles, while Zane Shellabear Healey had 23 disposals (all kicks), four marks, seven tackles and four inside 50s, but was inaccurate up forward with three behinds. Jack Mayo was the lone hand up front with four goals from eight scoring shots, 12 disposals, seven marks and 11 hitouts, while Liam Hickmott laid 10 tackles and booted a goal from 17 touches. Claremont has held on for the upset of the round, taking down top-of-the-table Perth in a two-point thriller. The Tigers stormed out of the blocks, booting four goals to one in the first term and led by 17 points at the main break, before the Demons hit back. 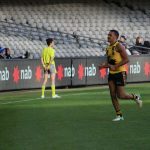 Perth booted three goals to one in the third term to draw within two points, but the Tigers managed to hang tough in the last term with both sides adding a goal and Claremont celebrating a memorable victory. In fairness to Perth, they were missing their top prospects who had made the Under 18 state squad. Max Grant won plenty of the footy for the winners, racking up 25 disposals, six marks, four tackles and booted a goal. Jack Monaghan had 22 disposals, five marks and three tackles, while Angus Longmire was strong in the ruck with 34 hitouts and 14 disposals. Lewis Henry and Benjamin Clohessy both booted three majors. For Perth, Zac Casey had the ball on a string with 31 disposals, six marks, eight tackles, five inside 50s and a goal. Maverick Hamilton (24 disposals, seven marks and four inside 50s) and Bailey Smith (21 disposals, five inside 50s) were the other big ball winners. Alan Narkle was a lone hand up forward with four goals from eight disposals, while Jarrod Schofield laid seven tackles and had four inside 50s from 12 disposals. In the battle between the bottom two sides, South Fremantle picked up an away win over East Perth – the second for the season. 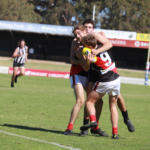 It was a close game for most of the contest before the Bulldogs broke away with a three goals to one third term to lead by 23 points at the final break. A two goals to zero last quarter saw the Royals edge closer, but it was not enough to get the four points. Tom Blechynden notched up 23 disposals, two marks and four inside 50s, while Manfred Kelly was one of the Bulldogs’ best with 23 disposals, four marks, seven tackles and three inside 50s. Matthew Ward was crucial in transition with eight inside 50s and four marks from 21 disposals, while James Russell laid nine tackles to go with 18 disposals. Thomas Weston did the most damage up forward with three goals. For the Royals, Jarrod Hamer-Mathew and Eric Bashemule both had 17 disposals, four tackles and booted goals, while Jordan Hayden also had 17 disposals and took four marks. Thomas Baulch and Rory Sparks combined for 13 tackles, while Kyle Robinson was the home side’s only multiple goal kicker with two majors from 10 disposals, four marks and five tackles. Another thrilling contest saw the game between the Falcons and Sharks decided by less than a goal. After trailing throughout the first half, the home side booted four goals to two in the third term to open up a nine-point lead with a quarter to play. East Fremantle had other ideas than to just shy away from the contest, and booted four goals of their own to the Falcons’ two in the final term, to run over the top of the home side and claim a three-point victory. Corey Robinson was enormous throughout the game for the Sharks, notching up 29 disposals and 11 marks, while Joshua Ritchie was also impressive with 25 touches, seven marks, five inside 50s and a goal. Nicholas Watson was good in the ruck and worked hard around the ground for 21 hitouts, 17 disposals and seven marks, while his partner in crime, Dylan Curley, also had 13 disposals, 16 hitouts and booted a goal. Mitchell Anderson booted three goals to be one of three multiple goal kickers for the winners, while Jai Jackson booted two from 16 disposals and nine marks. Nathan Murray was the round’s highest ball winner, leading the Falcons with 34 disposals, three marks, three tackles and five inside 50s. Tyron Hindmarsh was also busy with 23 disposals, three marks, six tackles and four inside 50s, while Alec Johnson (22 disposals, seven marks) and Daniel Rowe (22 disposals, six tackles) were among the best. Jack Burke made an impact up forward with two goals from 19 disposals, six marks and four tackles, while Ben Johnson had a team-high seven inside 50s from 20 disposals and a goal. Second placed Swan Districts had the bye.